Sellers say PayPal is no longer showing them email addresses of their eBay buyers, and PayPal told us it's due to eBay's policy. Not only is PayPal leaving out the information in email notifications, but it's not allowing sellers to view the email address of buyers even when signed in to their PayPal accounts. Confusing matters is that PayPal is phasing in this change - the first indication of a change was in this Letter to the Editor we published on April 7th - some sellers were still seeing email addresses at that time, others were not. Also confusing were responses from PayPal customer service reps.
More recent reports surfaced on Ecommerce EKG, and we've received additional reports via email as well. A reader said, "I am sure my business is not the only one that sometimes need the email address of a buyer. If I cannot independently verify payments using email and telephone, I reject those payments when I notice a possible scam." One eBay user welcomed the change, however, saying there was no valid reason for any seller to have any buyer's email address. However, that would imply eBay doesn't provide the email address of the buyer to the seller itself. On April 9th, a seller responding to the report on the Letters blog said, "Email addresses are still showing on the Sales Record at eBay which you can access from the hub. Probably not for much longer, though." Sellers are speculating the change has to do with eBay's transition to a payments intermediary. When we reached out to PayPal today, a spokesperson referred us to eBay, telling us it's an eBay policy. We reached out to eBay this evening. I can see my buyers email address on Paypal when I switch over to the "classic site"
There are probably a few factors at play here, but I'm confident eBay's ongoing efforts to prevent off-site sales are among them (which is also my speculation for the recent seller newsletter downtime). eBay doesn't want current transactions taken off the site, but they also don't want sellers enticing buyers off-site for repeat purchases (which is arguably most economically performed via post-sales email marketing). I predict that further buyer/seller firewalling will continue, and it would not surprise me if eBay pilots a fulfillment operation they test out removing seller info much like a dropshipper. In some bizarre future eBay still will not own any of the actual product in their marketplace, but for practical purposes it'll all be ''eBay'' product to buyers. I am also able to see it when I switch to classic view in Paypal. This is just one more attempt on Ebays part to stop what they consider to be rampant off Ebay sales by all sellers. Of course they sign up all of these big box stores like Target, Best Buy and others who have done nothing but steal Ebays business by including a discount coupon in their shipments. This coupon is good for their next purchase on the sellers own web site thereby taking another buyer from Ebay for a very low customer acquisition cost, but Ebay does not see that or have an issue with that, only the little guys that they think are the problem. PayPal has learnt from eBay’s bad behaviors- ignore your customers. SELLERS pay the fees and NO ONE else - PayPal should only answer to sellers. Of course Amazon just added buyers home phone numbers to each sale so you CAN contact buyers. Time to forward this on to my state Attorney General, as it is simply another avenue for fraud. I did do this with the "seller protection" issue where buyers could not sign in to an account and absolve paypal of all fraud liability, and I"m sure it didn't hurt anything. By all means, anyone who reads this go to your state AG's web site, and send them a quick message/complaint about paypal - how withholding buyer-provided contact information for remote and mail order sales, which can lead to inability to contact people and increase credit card fraud. In the age of connectedness and information, ebay feels their only solution is to try and stop communication? Are we going to have to communicate via mailed letters again? Maybe Devin can think about this while he is sitting at the General Motors board room spacing out about where his next $50,000 3-week vacation is going to be - instead of solving the problems at the company he is actually employed by. Communication isn't the problem dude - your brand is tarnished because you have allowed 3rd world country and scam sellers to exist, and you have equally punished the ones that aren't - the ones that keep your lights on. The idea that I can't communicate with a buyer by any other means than ebay messages or mail is just insane, and backward-thinking. Not "visionary". Please just take your golden parachute already? I cant see any buyers email address on my end - and theres no way that I know to switch to the classic view (what ever that is). 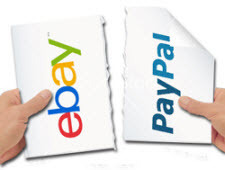 I said my piece above - Paypal deserves to lose the eBay business going forward - just because they have become nothing more then eBays lackey. I had a recent issue with Paypal - and they did do the right thing by me - I regret rating them in the email survey to high. I dont need the buyers email - if I want to work around it - Ill do it through eBays messages - its the point here though (for me). The twin dopes of ecommerce .... just when you think you've seen all the stupid any person can handle! Mine are still visible so far. My most recent PayPal message doesn't show the buyer's email address in the message itself (showing their eBay ID only), but PayPal *did* still set the Reply-To: header to the buyer's email (for me, anyway). I can still see the email addresses in the classic version for the time being. I get the eBay email addresses through my third party management company but it isn't necessarily the same as their Paypal email. There is only one reason I may need it. Every once in a while someone purchases an item that is going to go First Class and they need it faster so they email me and ask if they can upgrade to Priority. That's when I would go and retrieve their Paypal email and send them a separate invoice with the Priority costs. Not sure how I'd do that if I don't have their email? For the classic view just open up the details of the payment in Paypal and look on the right hand side of the payment information right under the refund this payment notice. I actually print off every invoice that I sell on Ebay for my records and they still have the email address on there. Then I make sure I input that into my spreadsheet so I have it available for use if I ever need it for any reason, including the bulk email announcing my new website when Ebay while trying to shoot itself n the foot again misses and shoots and kills their site completely !!! Time to get a credit card merchant account and stop accepting Paypal, or any other third party payment processor. If 60% of sellers refused to do business through Paypal (and I do) they would have no where to go. Some people (like me) collect all the customer and transaction information from their PayPal history report, not from each transaction on the fly. That gets downloaded in a csv file, pdf, or excel sheet on a periodic basis. But PayPal is no longer recording the buyer email address there. I did a report as a quick check, and the email addresses are replaced in each cell with a message to go to your eBay account if you want to contact the buyer. I'm moving to plan B, which is my Auctiva account. I can get a similar report. Email addresses are still showing up there. Email addresses are still on the ebay Sales Records and in the Hub (for now), but those records cannot be downloaded in a herd, to my knowledge. The email addresses on ebay dissolve from these records 45 days from the sale date. Pace mentioned that Amazon has added the buyers phone number as if that is a great thing. Amazon sellers are only to use that when absolutely neccesary for dealing with the initial order and shipping it. Other than that no way. On top of that many buyers have opted in for not accepting emails from sellers. Which means problems like I had this past week. Custmer wants a return and Amazon auto authorizes it with no communicationa between the seller and me. When I finally get the merchandise back I refund less shipping and and a restocking fee. Buyer shoots me an email wanting to know why only a partial refund even though I had emailed her about this, I email her back, the next day it starts all over again, she sends me the same email and I email her back, then I get a negative feedback (my first of this kind, most venues I have maintained 100% positive) saying I don't care about customer service and I had never responsed to her. Then she warns other sellers from buying from me. The problem, she has apparently blocked seller emails, or she didn't check her junk email file in case, and didn't bother looking for an email in her messages on Amazon. I did everything I could, within Amazon rules to get ahold of this woman. Yet I am the one that gets punished in my feedback, because Amazon just like ebay is terrified about us actually communicating with a buyer. ECRATER doesn't block buyer emails and so if a problem pops up we can handle it easily. Amazon and ebay treat sellers like kindergarteners that can't be allowed to think or cross the street on our own while eCRATER treats us as adults. It is very rereshing to say the least. Ebay is a desperate draconian company, that is looking everywhere else for their problems, instead of looking in the mirror. pace306, I was thinking how incredibly paranoid eBay is compared to Amazon (and other sites that I sell on as well) after I read the article above. Eventually eBay will have such a fire wall between buyers and sellers it will be impossible to communicate at all. I can envison Wenig in his ivory tower screaming "Build that Wall! Build that Wall! MaxMad states "Ebay is a desperate draconian company, that is looking everywhere else for their problems, instead of looking in the mirror." You nailed it MaxMad. Too arrogant to do so. Remember, pride goeth before a fall. Do you not offer Priority Mail as a shipping option the buyer can choose when paying?